*As a Yemeni, I was terrified when Donald Trump won the presidency. I couldn’t express exactly what I was terrified of, or how he would have policies that would have an extremely damaging impact towards Yemen. But my instinct made me fear of a coming nightmare. I’ve had the anguish of imagining Yemen, one of the poorest countries in the world, versus the US, a superpower on earth. Not long enough, last week, Yemen, along with six other Muslim-majority countries took the first bullet of Trump’s administration’s extreme nationalist and racist foreign policy in the Middle East. Ironically, on the 27th of January, the same day of the Holocaust Memorial Day, Trump signed an Executive Order that imposes a selective ban on people from Yemen and nationals from other six countries from entering the borders of the US. The immediate reaction by US-related Yemenis was disbelief, while Yemenis inside Yemen did not care much, “as if this matters to us, we who have been living under naval and air blockade under the war,” as one friend in Sana’a told me. Overall reaction was understanding that this is another phase of deepening the longstanding animosity and anti-American sentiments that Yemenis have for the US administration, not only in light of the US 15-year-old drone strikes campaign in Yemen that slaughtered more noncombatants civilians than combatants, but also in light of the US involvement in the ongoing conflict in the country in its support for the Saudi-led coalition airstrikes campaign. No clear condemnation statement from Yemen’s exiled president in Saudi Arabia, Abdu-Rabu Mansour Hadi, has been made yet, while former ousted Yemeni president, Ali Abdullah Saleh and Houthis’ authority in Yemen has condemend the ban. Condemnation is not enough at this point. The least that can be said about this disgraceful order is that it is discriminatory. As a Yemeni, I’m enraged. I think of the largest Yemeni diaspora community, which is residing in the United States. I think of my Yemeni friends who recently have taken the risky and costly road to seek refuge in the US, following the war in Yemen. 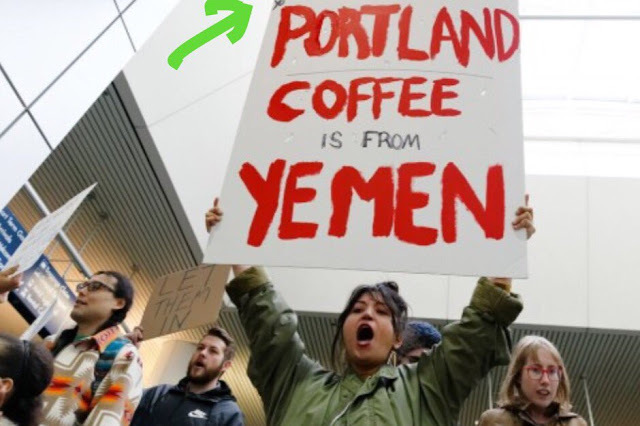 I think of the American-Yemenis’ tears and pain, as they are stuck in airports around the world, asked to be deported to war-torn and starving Yemen. I think of their fate and what worse reality the future holds for us. The day after the ban was under effect, American commandos conducted a raid into Baidha province, in south Yemen, killing one local al-Qaida leader but also around 30 civilians mostly women and children. Among those shot dead was eight year old Nawar al-Awlaqi, the daughter of the jihadist cleric, the Yemeni-American Anwar al-Awlaqi, who was killed in 2011 by an American drone strike. Nawar’s brother, 15-years old, Abdulrahman al-Awlaqi, was also killed by a US drone strike weeks after his father. Both former president Obama’s and president Trump’s administrations have always showed eagerness in conducting their operations in their war against terror in Yemen, but the aggression and hatred has never been as consistent as is the case under Trump’s rule. Trump’s policies show that Yemenis’ lives don’t matter and will not matter to the current US administration. The administration sends a clear message that it’s legitimate to rip Yemenis from their right to free mobility, while mercilessly bombing them in their homes. Giving this inhuman situation, we should all worry about the backlash. *This article was first published in the Swedish Institute of International Affairs' online magazine, utrikesmagasinet.se on 30-01-2017.